Plugged In is excited to have you participate in our spring session band class. Together we can make music that changes the world! Does the student have a sibling participating in 2018 Fall Session band class? Would the student like to be in the same band as the previous session? A minimum of 3 day/time options are required. Plugged In's goal is to match each student to a band they will enjoy and thrive in. The more day/time options we can consider while making band placements the more opportunities we have to make the perfect match. To ensure the best possible band placement students are encouraged to provide as many scheduling options as possible. Plugged In holds a benefit concert at the end of every session. The benefit concert acts as a recital where students perform the sets they've been learning for an audience. In addition to the performance the benefit concert also gives students a unique opportunity to give back to the community. Each benefit concert raises funds and awareness for a charity chosen by the students. The concert shows students they can make positive change in the lives of others by doing something they love, like playing music. Plugged In's concert scheduling policy has changed and we no longer accept concert schedule requests. As Plugged In continues to grow so have our benefit concerts. To accommodate our growing community the concert format and scheduling policy required updating. We've done so in a way that allows us to craft a stellar show that gives our students, audience, and the charity benefiting from the concert the best possible experience. In addition to creating a better performance experience for everyone, the new policy also allows us to be more thoughtful when scheduling younger students and those with special needs. Finally the new policy will reduce the overall time students are required to be at the show, lessening the scheduling burden on families. Although, we hope you'll enjoy the performances so much you'll stay for the entire show! The updated policy is provided below in the Policy section of the registration form. Our community thrives on mutual support and involvement in and out of band class. It is common for students to participate in more than one band, volunteer to help other students, support other programmatic pieces of Plugged In, etc. There are many ways that students and families can get more involved in Plugged In, all of which bring our community closer together. Each session many students participate in more than one band. This provides our students with the opportunity to meet additional musicians, play different types of music, and even try new instruments. Participating in additional bands also helps Plugged In create the best bands possible for all of our students. Any student can elect to be in more than one band. To keep Plugged In sustainable, students can choose to pay for their additional bands. However, to ensure all of our students have access, payment is not required. *We can not guarantee additional band placements. *Students selecting a "your choice" option will be contacted for additional information after your registration is submitted. *Students who choose to pay for their additional bands will be invoiced if placement is successful. Is the student interested in being part of the Plugged In volunteer team? The Plugged In volunteer team formalizes our already active volunteer program. Students have the opportunity to volunteer in bands with younger or special needs students, set up at performances, hang concert flyers, etc. Are you (the parent) interested in volunteering at Plugged In? Parent volunteers provide support in all areas of Plugged In and are crucial to our continued success. Opportunities include joining our Board of Directors or sub-committees, helping with performance set-up and breakdown, marketing, and more. I'd like to be contacted about private instruction at Plugged In. Plugged In's scholarship fund was created to meet the need of those students who are interested in participating in Plugged In, but whose family may not have the financial resources to pay full tuition. Plugged In's goal is to ensure music instruction and a welcoming community to all young musicians. To help determine a family's need for scholarship applicants must provide the requested financial documentation. Applicants are also able to share and factor in any extenuating circumstances that may effect their ability to pay tuition. Examples of extenuating circumstances can include but are not limited to, limited income, sudden death or abandonment of the primary provider, single parent households, etc. Applicants may be asked to provide additional documentation to illustrate their need to qualify such as recent pay stubs, letters of reference, etc. Plugged In is committed to ensuring all young musicians have access to programming. This is typically line 37 on your IRS tax form 1040. Please provide us with a copy of your most recent years IRS form 1040. .pdf and .jpg file types accept. Upload limited to 10MB. If you are unable to provide an electronic copy of your IRS 1040 form please contact Plugged In for support. Please select your level of scholarship. 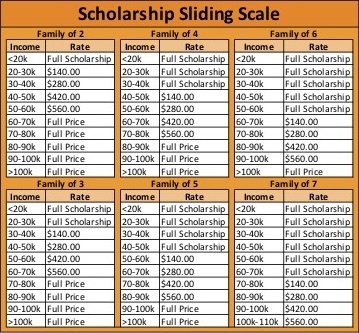 Please choose the appropriate scholarship level for your family based on the Sliding Scale chart above. If you have described an extenuating circumstance above please select the scholarship level that best fits your circumstance. You will be contacted if Plugged In requires additional information regarding your choice of scholarship level. *If you wish to submit payment for any remaining tuition fee after scholarship using your credit/debit card please contact Plugged In for an electronic invoice. Please choose the appropriate scholarship level for your family based on the Sliding Scale chart above. If you have described an extenuating circumstance above please select the scholarship level that best fits your circumstance. You will be contacted if Plugged In requires additional information regarding your choice of scholarship level. The sibling discount is reflected in the rates below. *If you wish to submit payment for any remaining tuition fee after scholarship using your credit/debit card please contact Plugged In for an electronic invoice. IMPORTANT - We have changed our concert scheduling policy! Please review the new policy before completing your registration.